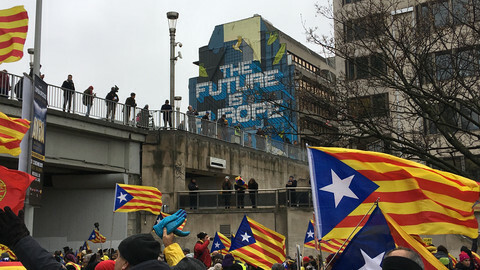 On 24 January 2017, in a packed auditorium at the European Parliament in Brussels, Carles Puigdemont already announced what was going to happen. 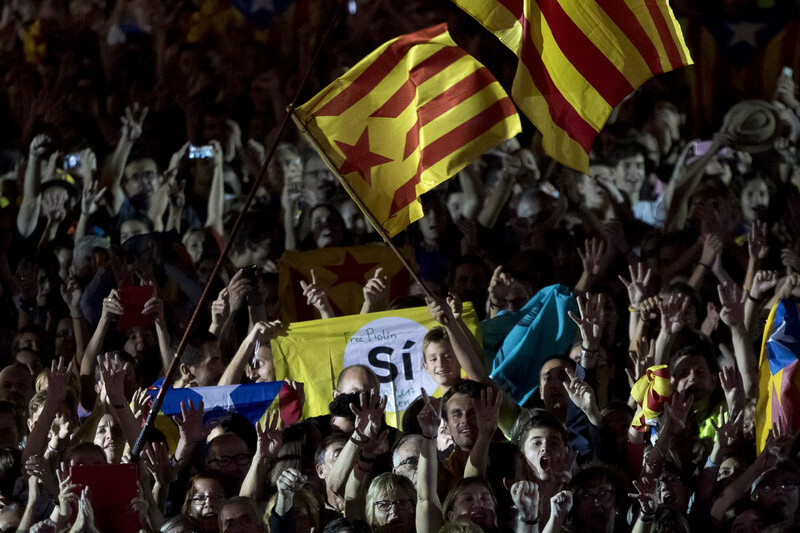 "At the latest in September 2017, Catalonia will hold a binding independence referendum," said the president of Catalonia's regional government - although the vote eventually took place one day after that deadline, on 1 October. "This is a European problem," he added, laying out his strategy to get EU support in pushing the Spanish government to accept the referendum. He argued that "the Catalan proposal for a referendum follow[ed] a firmly Europeanist inspiration" and that "Catalonia as a whole is deeply involved in participating in the European project". "Europe cannot look the other way. Europe should be part of the solution," he said. Nine months later, on 31 October, Puigdemont was back in Brussels, briefing the press at a smaller venue - the Press Club - which spilled over with more journalists and media than his first appearance. This time, he comes as a former, dismissed leader - fleeing what he said was "unfair justice" in Spain and calling on the EU to "react". He insisted that EU inaction - in the face of Madrid's takeover of Catalan institutions after the region declared its independence on 27 October - would be "the end of the idea of Europe", "a mistake that we can all pay, at a very high cost, as European citizens". 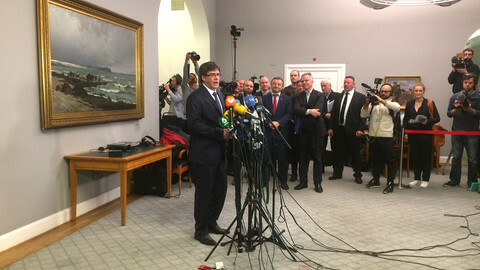 Puigdemont appeared again at the Press Club, on 22 December, a day after Catalan voters gave a majority of seats to separatist parties, with his list, Together with Catalonia, the biggest within the separatist camp. The politician, more relaxed and feeling vindicated, asked for "respect" and "guarantees" to go back to Spain and take office. And he asked the EU to "listen to Catalan people." later two were broadcast live across the EU, such was the crisis. Europe was finally forced to give its full attention on the region's crisis after images of Catalans being beaten by Spanish police while trying to vote were splashed across European and global media; the local parliament declared Catalonia's independence and the Spanish government took control of the region's institutions. Puigdemont, along with twelve other members of his dismissed government were charged with rebellion, sedition and embezzlement and faced up to 30 years in prison. After months of apparent disinterest, Europe was suddenly left contemplating how the crisis could be solved. "We saw the problem growing politically. We saw that we were heading for a train crash. But we saw it very late, just a few weeks before the referendum," an EU official admitted to EUobserver in November, on condition of anonymity. 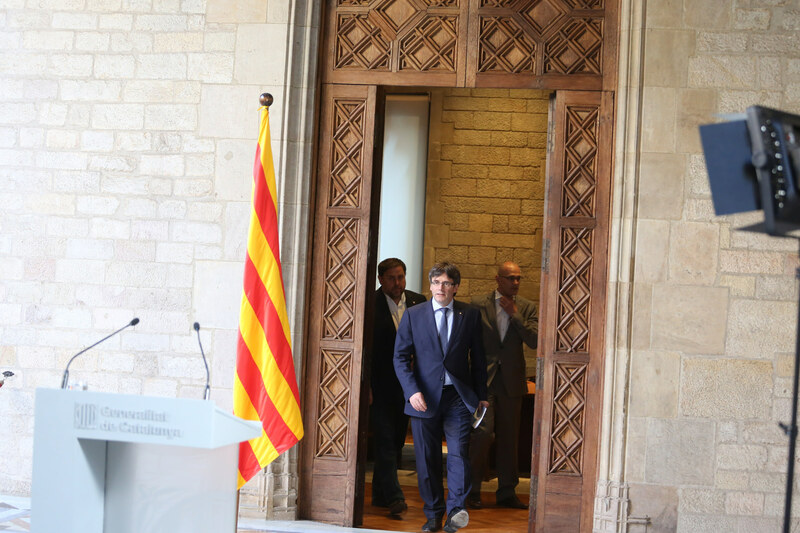 Despite Puigdemont's warning in January, EU institutions only started to look closer at Catalonia in early June, when the Catalan leader announced the date for the referendum. In an interview to a group of journalists, including EUobserver, Puigdemont warned in early July that "nothing" would stop him. But there was no reaction from Brussels or EU capitals when the separatist coalition, on 5 July, presented the referendum bill, which said that independence would be declared "within two days" if the Yes side won. 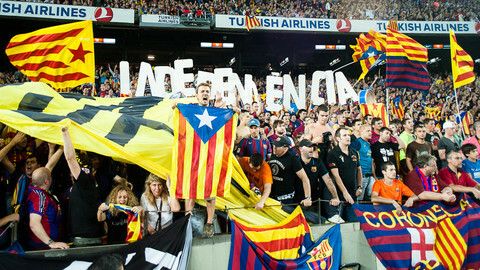 Or on 6 September when the bill was adopted by the Catalan parliament through an extraordinary procedure. "We hoped there would be a dialogue, a solution, or that at least the referendum would be legal, as in Scotland," the official added. Even when it was clear that Madrid and Barcelona would not talk, the EU still rejected calls for mediation, arguing that it was an "internal issue". The European Commission, to whom calls to intervene were mainly directed, did not want to take a position before member states acted, and insisted it was not within its institutional role. The Council of the EU, which represents member states, also kept quiet on the crisis. "If that is not a taboo, it looks like it very much," a source from a member state told EUobserver in September. "All member states are embarrassed." "There is a very, very strong principle: we don't meddle in domestic politics when it is about the constitutional order," the first EU official pointed out. When images of police violence in Barcelona on 1 October were broadcast, EU institutions faced an "unexpected" situation, he added. But the principle of non-interference continued to prevail. 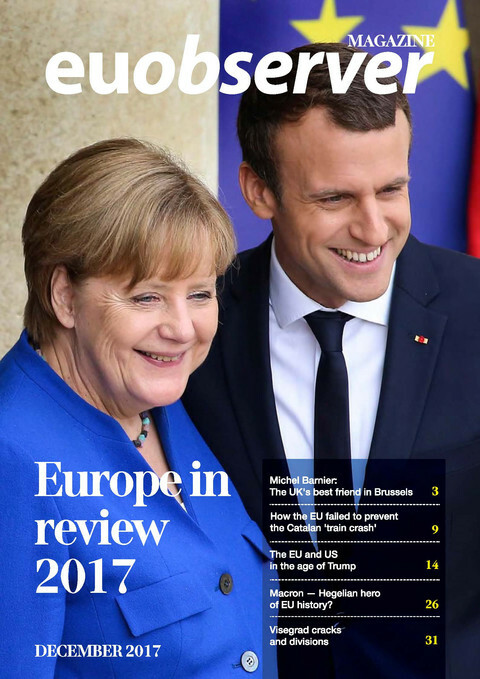 "I don't think the EU was not interested [in what was happening]," political scientist Camino Mortera-Martinez told EUobserver. "Both the Spanish and the EU did not think it would go that far. It was unthinkable, even for Madrid." While the EU, for political and institutional reasons, tried to contain the escalating showdown within Spain's borders, both the Spanish and Catalan governments careered obliviously into the deadlock. 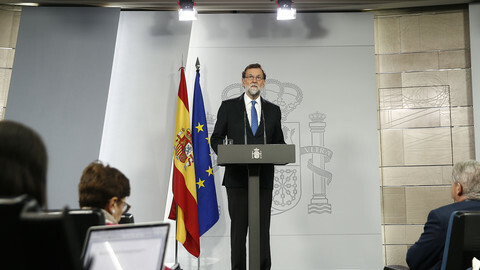 In Madrid, prime minister Mariano Rajoy relied on a constitutional ruling that a referendum would be illegal and refused to discuss its organisation, repeating right up to the 1 October referendum itself that the vote would not take place. Rajoy is leading a minority government, after two inconclusive elections in 2015, and has been weakened by corruption cases against his centre-right Popular Party. 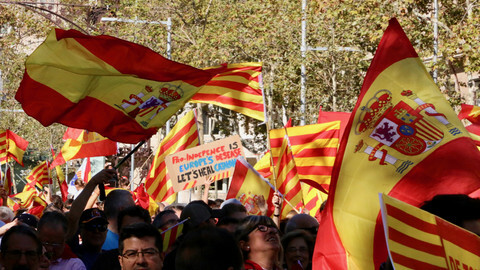 The defence of Spain's unity is a strong element in his party's manifesto. "The Spanish government was very naive," noted Mortera-Martinez, who works at the Centre for European Reform, a think tank in Brussels. "It thought that it would be enough to say that the referendum would not happen, and that if it happened it would be enough to send the police." Meanwhile in Barcelona, the Catalan government fell into its own trap and convinced itself that it would have support from the EU. It organised its communication very well, with unofficial 'embassies' in EU countries and press trips for foreign journalists - including EUobserver. "They saw that people were eager to listen to them," unlike the Spanish government, Mortera-Martinez said. "They thought that because people were listening to them, they were going to support them." In the end, "there was a very thin line between reality and fantasy". "What astonished me the most is that Catalans were disappointed [not to get the support they expected]," the EU official observed. "Even Kosovo, which was supported by the US, the UK, France and Germany" struggled to be recognised when it declared its independence in 2008. From Puigdemont's January address to the weeks that followed the referendum, and Madrid's takeover of the region's institutions, Catalan separatist leaders based their demands for EU support on what they said were Spain's violations of civil rights and democracy. "Maybe what is happening with Poland gave them the impression that the European Commission would intervene," the official noted, referring to the rule-of-law monitoring launched by the EU executive in 2016. So could the EU have avoided the escalation and deadlock? "I cannot really see what could have been done differently," the official said, insisting on respect for the internal constitutional order of member states. He noted that "maybe" some member states "could have sent messages" to the Spanish government to suggest dialogue with the Catalan leadership. But national elections in France and Germany probably diverted the attention of EU leaders. "What EU leaders should have done was to explain to Rajoy that he should not be so closed to a solution," said Mortera-Martinez. But she noted that the Spanish PM's colleagues were also dependent on his view of the situation. "If Rajoy tells you that nothing will happen, you believe him and think: 'Why bother? '," she said. 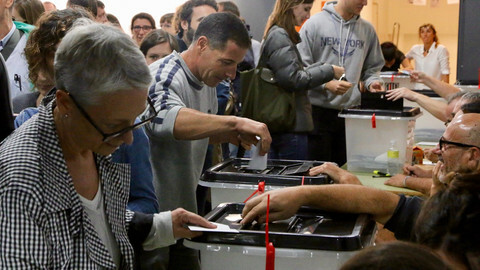 The Spanish PM and Catalan separatist leader said they were open to dialogue, but on different grounds, after Thursday's elections in Catalonia gave a majority of seats to the pro-independence parties.